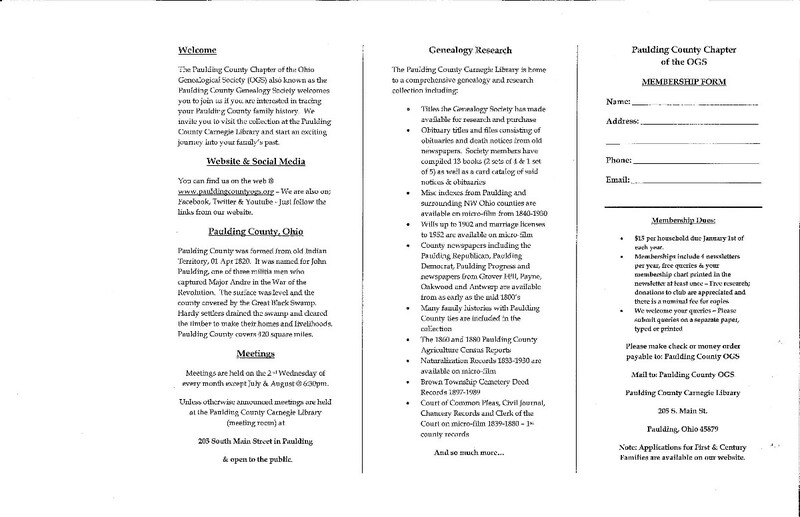 The Paulding County Chapter of the Ohio Genealogy Society (OGS), also known as the Paulding County Genealogy Society, welcomes you to join this group if you are interested in tracing your Paulding County family history. You are invited to visit the collection at the Paulding County Carnegie Library and start an exciting journey into your family’s past. 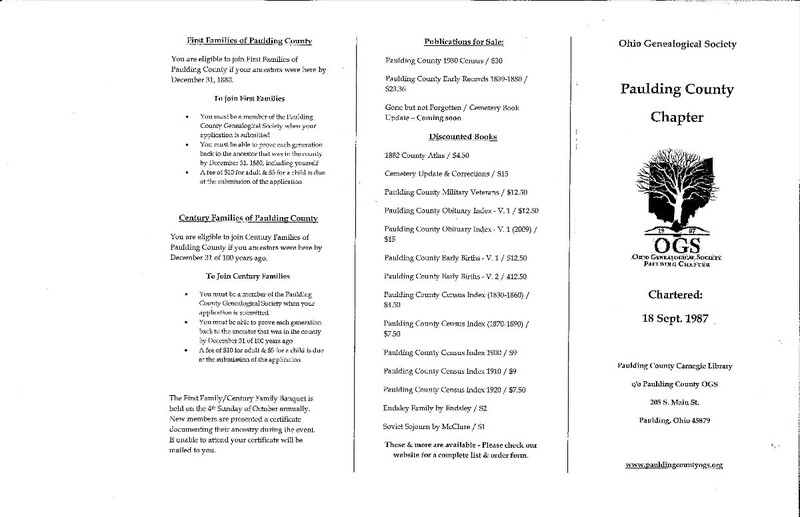 Meetings of the Paulding County Genealogy Society are held on the second Wednesday of each month at 6:30 p.m., except July, August and December. Unless otherwise announced, the meetings are held in the meeting room of the Paulding County Carnegie Library, 205 S. Main Street, Paulding, Ohio. Click here for a map to the library. The First Family/Century Family Banquet is held on the fourth Sunday of October. New members are presented a certificate documenting their ancestry as a First Family. The First Family/Century Family Banquet is held on the fourth Sunday of October. New members are presented a certificate documenting their ancestry as a Century Family. The Paulding County Carnegie Library welcomes researchers from throughout the United States, Canada and the world to visit the library when beginning a search for their Paulding County roots. Searching for ancestry can be a great adventure. The extensive collection at the Paulding County Carnegie library can help you get started. Included in the collection is an obituary card file, cemetery records, birth records, family records and much more. Researchers also find the Hayes Obituary Index a useful online-tool. The Paulding County Carnegie Library is also within easy driving distance (40 miles) from the Allen County Public Library (ACPL) in Fort Wayne, Indiana. The ACPL owns one the largest genealogy collections in the country and is world renown for its resources and comprehensive collection. Bittersweet Inn, 11797 SR 111, Paulding, Ohio 45879. Phone 419-399-2861. Clean, picturesque, remodeled farm home. Relaxing atmosphere. One mile from library. Write down everything you can find out about your ancestors from your own knowledge or by interviewing living relatives. You can do this in a notebook to begin. Write down full names, places where they passed away, marriages, etc. Keep track of dates. Put your information in chronological order. A five-generation chart is helpful. Most public libraries can find a chart for you, or you can find one by conducting an online search. Visit your public library and consult “how to” books on tracing your ancestry.